I never seem to run out of things to blog about, but I am always short of time to blog. When I have days off work, I tend to blog up a storm. That is the case today with three posts! 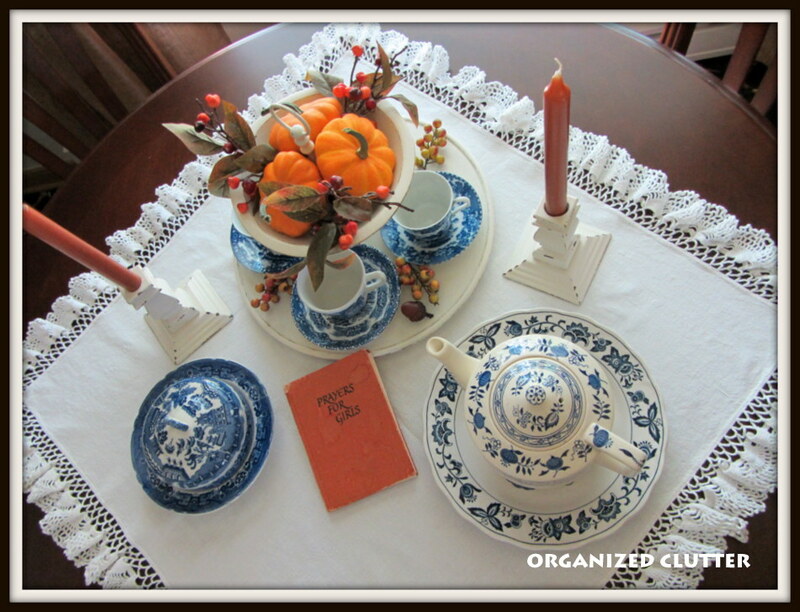 For this post of my fall dining table vignette, I have started with that old tiered, wooden tray I purchased earlier this year and repainted white. Here is the tray as I found it for $2. 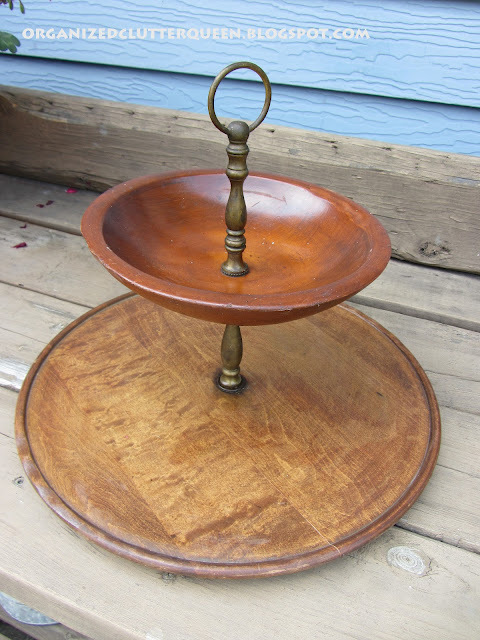 The tiered tray also was painted with the dry brush technique, Rustoleum Heirloom White, and slightly distressed. I added blue and white cups and saucers to the bottom shelf and real mini pumpkins and faux leaves and berries to the top bowl. The candlesticks were just purchased at a consignment shop for $3. They were stained wood and I gave them the Heirloom White treatment too. There is a Blue Willow covered dish and a Sadler teapot. Today, I have framed my fall display photos on Picasa with museum matte for a different effect. The book was a recent $2 find "Prayers for Girls" by Elisabeth Robinson Scovil, 1957. 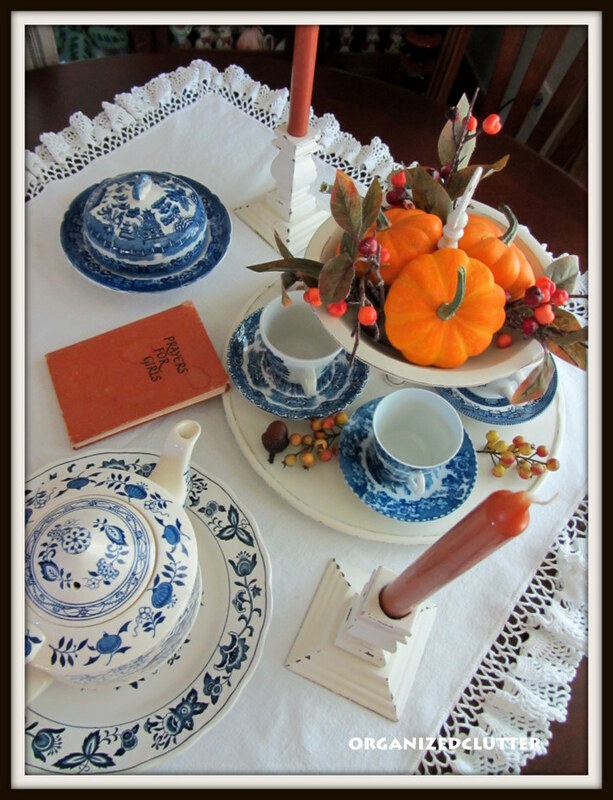 I got my inspiration for the combination of blue and white dishes and fall orange from a tablescape done by Yvonne at Stonegable. It is a pleasing fall combination! This looks so pretty, Carlene! 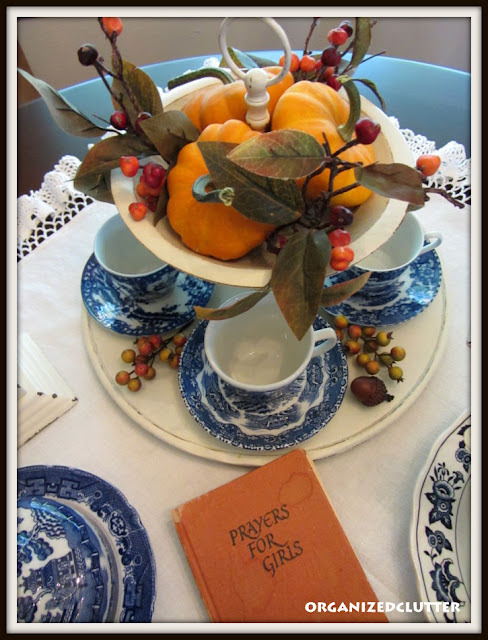 I love blue & orange together and added some blue to my Fall mantel this year. I love your tiered dish! 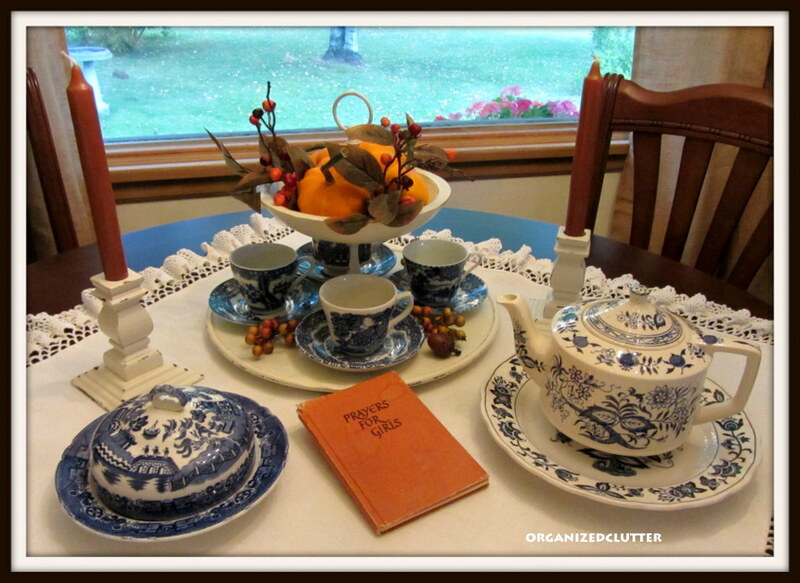 Love your tablescape, and what a find. I love it when I find things at such a good price. I have used the Heirloom White in the spray paint. Do they have it in a can as well. I like it painted white. SO much better than the original state. This is beautiful Carlene! I too love blue and white. 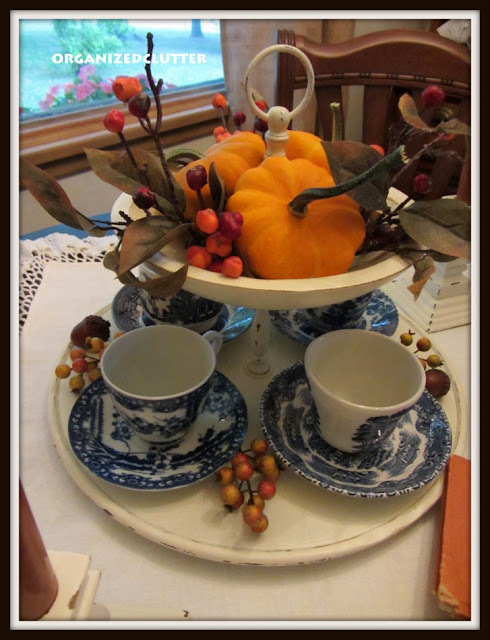 The painted tiered tray is perfect with your fall pumpkins! This is just beautiful Carlene! I love your two tier and how you decorated it with all the beautiful blue and white dishes. I'm loving the pretty teapot! Happy weekend. 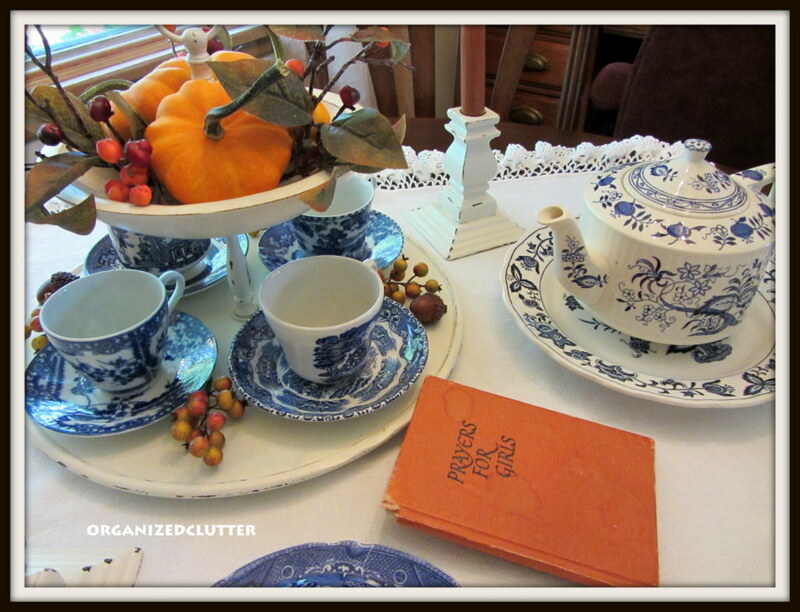 I love the blue and white china with the orange pumpkins. the tiered plates are lovely also. Very pretty. You can never go wrong with blue and white. Carlene the tray is awesome. What a fabulous idea! There is something to be said about the elegance of blue and whites. 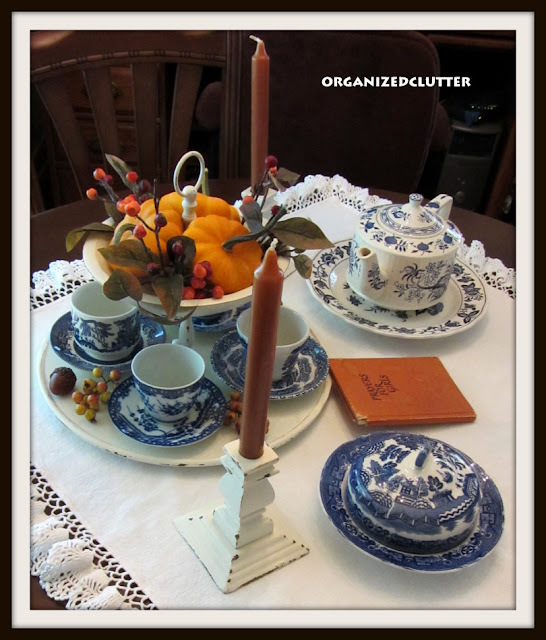 I would love it if you could share this wonderful post at our What’s it Wednesday linky party. I hope you can join us. Really pretty and how clever to paint the tiered piece! Of course, I love anything blue and white! Hi Carlene. I just came over from Olive Out's blog where I saw your comment about being from Minnesota. I am from Minnesota too in the southwestern part. You must be from northern Minnesota with the low temp you had this morning. I have looked through several of your posts and love the way you decorate junk/treasures. I am now your newest follower. I have a daughter whose middle name if Carlene. Love all your 'treasures' too. You have an eye for putting things together, and re-purposing items. Your table is beautiful. I like the way you decorated the tiered tray. Great look! Thanks for visiting and leaving a comment! Happy Sunday! Love what you did with the tiered tray! Beautiful table, Carlene! The tiered tray is sooooo much better in white! Thank for sharing at Potpourri Friday! Catching up on of your fun posts that I have missed. I love blue and orange together! I loved your tiered bowls when I first saw them and how perfect for this tablescape? Love it all and oh, I'm drooling over that book! What a great find that tiered tray was! Looks great in white and what a pretty tablescape. I love blue and orange together too!